QUEENS, NY, 9/16/16 – Marketing strategy & design donated by 816 New York to Pets for Patriots helped their sponsored dog, Hooch, earn enough votes to win the American Humane Association’s 2016 American Hero Dog Awards. In all, Hooch won $7,500, some of which will be shared as a donation to Pets for Patriots. 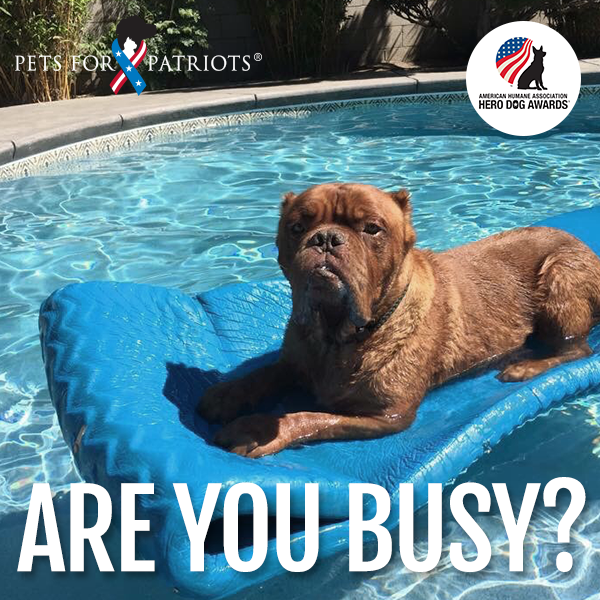 As part of their ongoing relationship, 816 New York’s founder and CEO, Sarah Williams, worked with the executive director and founder of Pets for Patriots, Beth Zimmerman, to create social media and email graphics, craft motivational social media posts structured around the calendar, and campaign strategy. Pets for Patriots is a New York–based non-profit that unites rescue animals that would have difficulty finding homes—because of age, condition, or other challenging circumstance—with veterans, many of whom suffer from PTSD. For this award, they were asked by Marley’s Mutts to help sponsor and promote their nominated hero dog, Hooch. Hooch suffered severe abuse—including removal of his tongue and badly cropped ears—yet still maintains a beautiful, happy spirit. After having been rescued, he now works as a therapy dog for children with autism, the homeless, and prisoners with addiction issues. The story has been covered by Today and other media outlets. The American Humane Hero Dog Awards were created to honor some of the most extraordinary heroes the world has ever known, the very best of our best friends. These courageous canines have gone above and beyond the call of duty, saving lives on the battlefield, comforting the ill, aged and afflicted, bringing hope to those who have lost it, and reminding us of the powerful, age-old bond between animals and people. All eight category winners tonight exemplify what it means to be a hero, and we hope that their stories—and Hooch’s—will inspire people to value our animal friends and to recognize and honor how much they do for us every day. PTSD awareness, animal welfare, and veterans affairs are three important causes particularly to Williams. “Volunteering with Pets for Patriots has been a gift, and being brought on to work with them is a continual honor,” she says. Pets for Patriots gives the gifts of fidelity, joy and love to both veteran and pet through companion animal adoption. The organization helps veterans and military members adopt the most overlooked shelter pets, including adult, special needs and large breed pets, offering them a second chance at life through adoption. Pets for Patriots partners with U.S. shelter and veterinary networks, military and veteran organizations, and the public to value and honor the lives of both the most vulnerable and heroic among us. For more information, visit www.petsforpatriots.org. Ready to share your story with us? We’d love to hear it!